RSS solves a problem for people who regularly use the web. It allows you to easily stay informed by retrieving the latest content from the sites you are interested in. You save time by not needing to visit each site individually. You ensure your privacy, by not needing to join each site's email newsletter. In the case of this site, signing up for the podcast will allow you to access the newest audio lessons using shortcut buttons that will appear in your favorites bar and in your link bar. Why would I want to use the iTunes Store for this site? 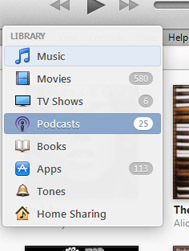 iTunes offers a simplified user interface for RSS podcasts and can effectively subscribe your iPhone or iPad to receive new audio lessons as they are made available. Everything we offer is still free of charge. Note: If the Podcast signup isn't working for you, you may have an outdated version of Internet Explorer. Click on the iTunes Store link and then click the "View in iTunes" button. Unless you currently have iTunes open, a popup will appear. 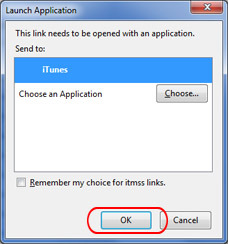 Ensure that iTunes is selected and click the OK button. Note: If iTunes is not an option, then that means you need to download iTunes to your computer. Click the subscribe button to ensure that you always get the latest lessons from us. First, navigate to the library (click the "Library" button in the top right of the screen). Now, navigate to your podcasts page by clicking the dropdown on the top left and selecting "Podcasts"
Now, you should see a screen full of all of our Rev the Book lessons. Now you just need to download each lesson that you want by clicking the download button for each lesson. Be sure to click the download button for every lesson that you want on your iPod or iPhone. You will know that it has been fully downloaded when a blue dot appears next to the title. Now that you have downloaded the lessons, navigate to your iPhone or iPod by clicking the button on the top right hand side of the screen. If you don't see the button, be sure your device is plugged into the computer. Once in your iPod/iPhone screen, navigate to the Podcasts tab. Ensure that you have the option to sync all unplayed files chosen. Now just hit the "Sync" button on the bottom right of the screen! That's it! Going forward, all you have to do is download the lessons you want and sync it to your device.